Confidently meet your workload SLAs with actionable intelligence to preempt issues, achieve peak storage health, and forecast and manage future growth. HPE Nimble Storage customers enjoy an entirely unique storage lifecycle management experience, driven by powerful, sophisticated data analytics and cloud connectivity. This experience is centered around HPE Nimble Storage InfoSight™ which integrates, automates, and substantially simplifies storage administrative tasks, ensuring the optimal health of all HPE Nimble Storage arrays. 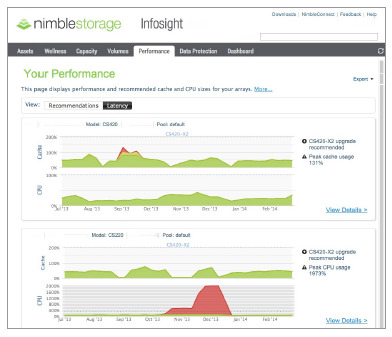 InfoSight, an integral part of Nimble’s Adaptive Flash platform, ensures the peak health of storage infrastructure by identifying problems, and offering solutions, in real time. InfoSight provides expert guidance for deploying the right balance of enterprise storage resources — dynamically and intelligently — to satisfy the changing demands of business-critical applications. 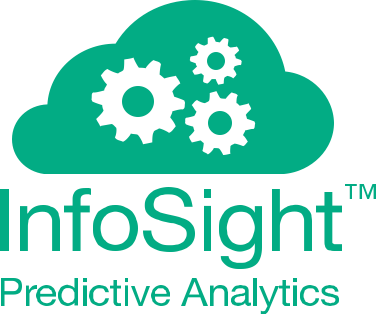 InfoSight is a cloud-connected deep-data-analytics engine that radically improves customers’ IT operations. It enables IT administrators to efficiently optimize workloads and deliver SLAs, proactively avert performance problems, monitor data protection, and accurately forecast capacity. Available instantly from the cloud, InfoSight integrates and automates disparate administrative tasks. An example: Its VM-level monitoring intelligence provides IT with insights at the granularity of each VM, and actionable recommendations on how to address conditions where an application may consume more than its allotted resources. Accessibility: InfoSight can be accessed from anywhere, anytime, on any device. One-click reporting and export capabilities make it the simplest way to monitor and manage HPE Nimble Storage environments. Registered Nimble resellers can also request access to their customers’ InfoSight portals, allowing them to be more proactive. New performance correlation analytics quickly identify leading factors contributing to performance or latency issues, eliminating what used to take up to several days of manual data collection and analysis. Assets: Maps assets to their specific geographic locations and displays their signature information. The executive summary provides a comprehensive view of storage status that includes storage and operational efficiency, data protection, and upgrade needs, enabling managers and executives to understand at a glance how well their storage is performing—including areas that need attention, if any. InfoSight’s analytics provide the ability to optimize and proactively plan storage capacity through easy to understand graphical information. This enables informed decision making on storage spend. Using systems modeling, predictive algorithms, and statistical analysis, InfoSight™ solves storage administrators' most difficult problems. Infosight also ensures storage resources are dynamically and intelligently deployed to satisfy the changing needs of business-critical applications, a key facet of HPE Nimble Storage's Adaptive Flash platform. 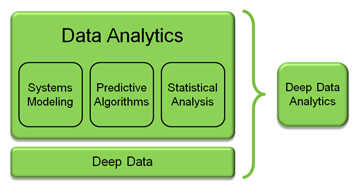 At the heart of InfoSight is a powerful engine comprised of deep data analytics applied to telemetry data gathered from Nimble arrays deployed across the globe. More than 30 million sensor values are collected per day per HPE Nimble Storage array. 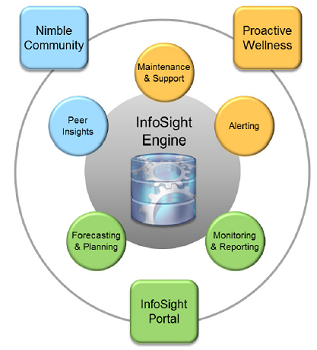 Through the InfoSight™ Portal, customers have a window into the InfoSight Engine. The InfoSight Engine leverages deep data analytics to build a complete picture of the overall health of HPE Nimble Storage arrays across any single or multi-site environment. Administrators no longer have to manually gather and process logs and performance data to identify trends or detect performance issues. The insights and actionable information presented via the InfoSight Portal help customers adhere to storage best practices and to make intelligent decisions about how to evolve their storage environments to support ever-changing workloads. And now Nimble resellers can request access to their customers’ InfoSight Portal and leverage the same information, allowing them to be more proactive in providing recommendations to their customers. HPE Nimble Storage takes a holistic approach to storage system health that increases uptime and maintains arrays in top working condition. Nimble arrays boast a rock solid and fully redundant design, and include an innovative, proactive support model that automatically resolves more than 80% of problems. Nimble solutions have achieved greater than "five nines" availability, the gold standard for system uptime. Download HPE Nimble Storage InfoSight Datasheet (PDF). Download InfoSight Business Brief (PDF).